Tank and Tankless vs. Heat Pump Water Heaters | MarGo Plumbing Heating Cooling Inc. Which Heating System Needs the Least Repairs? When it comes to choosing a water heater in Cedar Grove, NJ, the classic debate is usually about tank vs. tankless water heaters. One uses a tank, the other doesn’t. However, things get complicated even further when a new challenger approaches: the heat pump water heater. For now, tank and tankless will have to join forces against this new enemy as we answer the question: Which is better, traditional tank and tankless water heaters or a heat pump water heater? First, let’s get on the same page about what tank and tankless water heaters have in common. Without understanding this, we can’t possibly compare them against a heat pump water heater. The main thing that these two systems have in common is their ability to heat water with electricity or natural gas. Other than that, they’re very different. Storage tank water heaters store the water in their tank and then heat the water. The water is then distributed to the home when requested by the warm water taps. Tankless water heaters create hot water on-demand, heating it near-instantly. Despite the differences in how they prepare the hot water, the most important thing is that they both use a fuel source to warm the water up directly. This is what makes them fundamentally different from a heat pump water heater. What Makes a Heat Pump Water Heater Different? 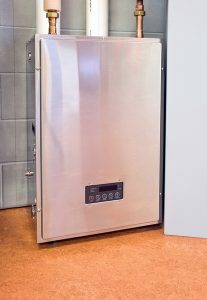 A heat pump water heater might not look all that different from a standard tank water heater. It also can use electricity, just like a tank or tankless heater. What makes them different is how they heat the water in the first place. Heat pump technology is something that was first used in air conditioners. Air conditioners use a chemical called refrigerant to initiate a phase change between two sets of copper coils: one outdoors, and one indoors. As air passes over the indoor coils, it removes warm air. The warmth is transferred to the outdoor coil and is released into the air. The absence of warm air in your home makes you feel cooler. A heat pump is an air conditioner that can reverse the flow of refrigerant. Instead of sending warm air outside, it can take warm air from outside and bring it indoors. This is the same process used by a heat pump water heater. The water is not heated by combustion or electrical resistance, but rather through this process of transference. Essentially, it “recycles” warm air instead of creating it from nothing. In terms of efficiency, the heat pump water heater is better. It can use electricity far more efficiently than a tank or tankless heater. The only issue is when temperatures get too cold—it might not be able to recycle enough warm air to heat the water. But if that does happen, a backup gas or electrical source can make up for the difference. Even with that downside, the amount of money you’ll be saving throughout the summer and through the mild winters will more than make up for it. Of course, we don’t want to make any promises too soon—your home and situation might not be ideal for one of these water heaters. If you think a heat pump water heater sounds right for your home, contact MarGo Plumbing Heating Cooling Inc. today to get started with a free estimate.